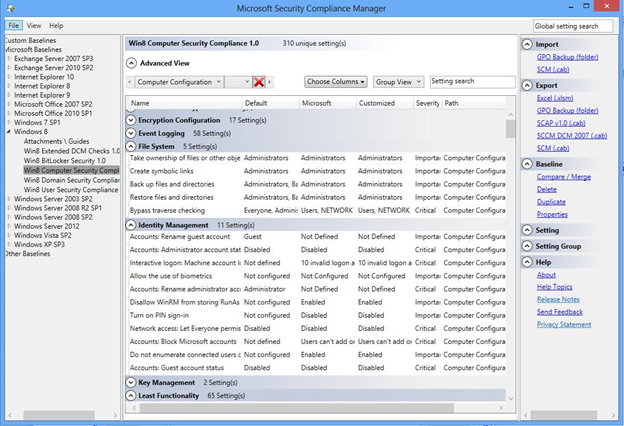 The Security Compliance Manager (SCM) is a free tool from the Microsoft Solution Accelerators team that enables you to quickly configure and manage the computers in your environment and your private cloud using Group Policy and Microsoft System Center Configuration Manager. 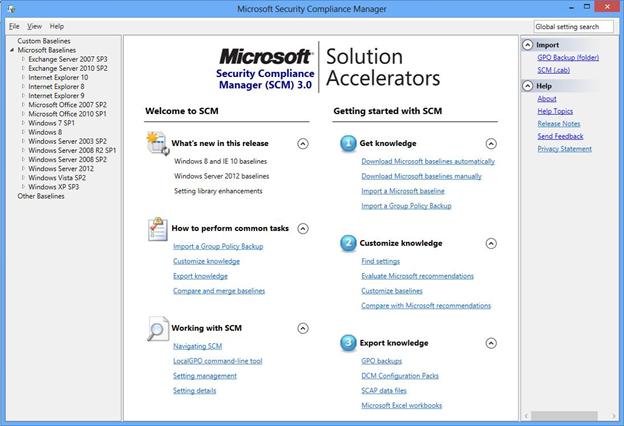 This version of SCM supports Windows Server 2012, Windows 8, and Internet Explorer 10. 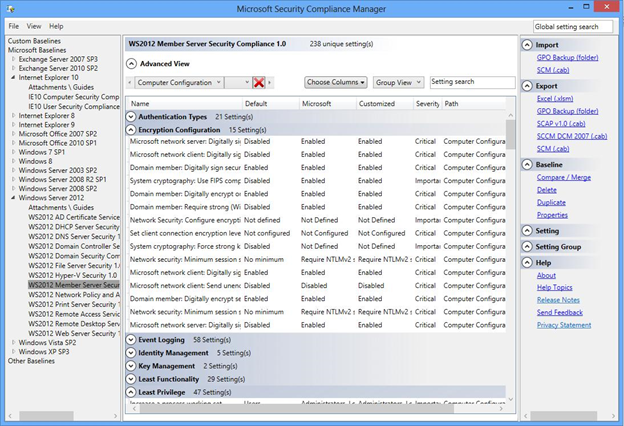 SCM provides ready-to-deploy policies and DCM configuration packs based on Microsoft Security Guide recommendations and industry best practices, allowing you to easily manage configuration drift and address compliance requirements for Windows Server 2012, Windows 8, and Internet Explorer 10, as well as other Microsoft applications. Now you can easily configure computers running Windows Server 2012, Windows 8, Microsoft Office applications, and Windows Internet Explorer 10 with industry leading knowledge and fully supported tools. In addition to the latest software releases, you can also configure previous additions of Windows Server and Microsoft Office. Download the SCM 3.0 from the Microsoft Download Center. · Gold master support: Import and take advantage of your existing Group Policy or create a snapshot of a reference machine to kick-start your project. · Comparisons against industry best practices: Analyze your configurations against prebuilt baselines for the latest Windows client and server operating systems. We’re excited to announce the collaboration between Microsoft and the Center for Internet Security, to jointly develop and provide free, best-practice guidance for further securing Microsoft Windows environments. As a result of this collaboration, organizations can now benefit from the collective expertise of these two organizations and their technical communities. Organizations that have deployed or plan to deploy Microsoft Windows 8, Windows Server 2012, or Internet Explorer 10 now have guidance and tools to help maximize the security of their deployments. Consumers of Microsoft products can now confidently adopt a configuration posture that is backed by both the Center for Internet Security and Microsoft. 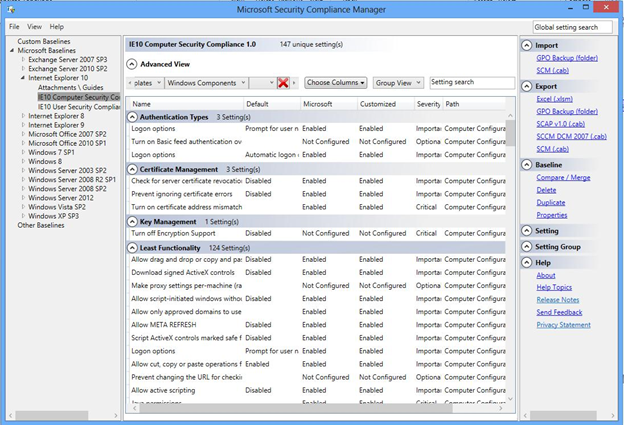 Microsoft is providing these recommendations and guidance via a free tool, Microsoft Security Configuration Manager (SCM) that enables quick configuration and management of computers, traditional datacenter, and private cloud using Group Policy and Microsoft System Center Configuration Manager. The Center for Internet Security is providing the same recommendations via its free security benchmarks. The latest version of SCM offers all the same great features as before, plus an enhanced setting library for Windows 7 SP1. SCM 3.0 provides a single location for creating, managing, analyzing, and customizing baselines to secure your environment quicker and more efficiently.